Grab Your Adventure Buddy – It’s Time to Trip Plan! Travelling with your partner is amazing, but planning a trip together can be difficult especially if you are not used to planning with others! 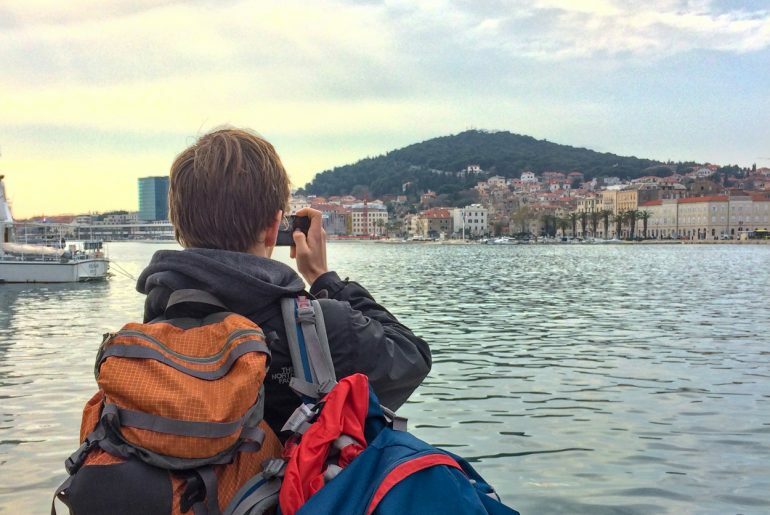 Over the last 1.5 years, we have been on quite a few adventures together, such as Lisbon in Portugal, Brasov in Romania, Budapest in Hungary, Herceg Novi in Montenegro, Split in Croatia, and good old Edinburgh – to name just a few! We have also moved continents twice so we’d say we have become pretty good at planning trips together. In our experience, we have found that we usually plan trips following a certain pattern. So, to make it easy for you to get started we prepared this step by step guide. Talking about where you would like to go and which places are on your bucket list is a good starting point. A good old fashioned brainstorming session with Google open and ready to type is usually a great way to make things happen. There are no right or wrong answers at this stage. Just start firing off ideas and see what you can come up with. Maybe you find out that you both really want to see Portugal or maybe you get new ideas from your partner with destinations that you haven’t considered. It’s important to have an honest conversation about potential destinations without committing to something as a first step in planning a vacation you’re both happy with. If you want to get more concrete, you could write 5 or so destinations down that you agree to look into further. When you plan and go on a trip together it is important to talk about your budgets and the time period you would be available to go on vacation. Depending on how much you separate expenses and how different your money situations are, this conversation is more or less important – it should be done to avoid potential frustration or arguments further down the planning process. It’s very well possible that you’ll find that one of you doesn’t have the anticipated budget for a vacation now – so maybe that island dream vacation will have to wait. Agreeing on a potential time when you could go on vacation (you might not get time off during a certain month etc. ), might narrow down your list further. You might decide to avoid certain destinations in South East Asia during the Rainy Season, for example. Now that you know what your budgets are and have a general idea about when you could go on a trip, you can do basic research about the destinations you had written down on your list or brainstormed about. Don’t do very detailed research, just look into how much flights and accommodation are on average for the time that you’re intending to travel. If you find that some destinations exceed your budget and there is no way you’d be able to make it work, cross them off your list. You could always visit them another time and you don’t need too many ideas clogging up the research process at this point. Wish Someone Safe Travels – Here are Our Favourite Safe Journey Quotes! Travel Visas necessary for entering the country. While the passport you hold might get you “visa-free” entry into a country, other times you might need a travel visa. Sometimes, these can cost money and time to apply for. Learn more about travel visas with this Beginner’s Handbook to Travel Visas. Vaccinations for more tropical places. Getting an appointment with a travel doctor can take time and you may have to pay for necessary medications or vaccinations. Time/cost from airport to destination. Are there transfers available? Do most people take a taxi? Is there a bus or train available to keep costs down? While you could take a cab, the bus is set up to take you right downtown in both Budapest and Edinburgh, for example. It’s very convenient and much cheaper than a cab. Are you staying in one place as a base and doing day trips or moving from Point A to Point B? You’ll have to factor in the prices of buses, trains, etc to get between places. The weather at the time of year in the destination. Too hot, too cold, or too wet might get you a discount on a vacation but will you be able to really enjoy your time? If you’re changing countries – how safe is that country to travel to? Typically your government’s website will have a travel section outlining safety precautions and advisories. Before you book anything, if you work in a setting where you’ll need to request time off – you should definitely request the time off. Since this can take longer for certain employers or companies, you might want to do this as early as you know when you’d want to go on your trip. This way, you know what dates you can play with when you’re booking things in the next step. You don’t have to have the destination chosen and “set in stone” to get the time off work if you have to request it. If you don’t have to request it, well then look at you go – what freedom! The next step for us is to book two parts: how we get there and where we will be staying. Everything else can be determined after the “frame” of the trip is set in stone. It’s a good idea here to split up your responsibilities. For us, Eric is usually responsible for accommodation, while Lisa is the one responsible for flights/transportation in general. That works really well for us and there is never an issue where we thought the other person would do it and then found out that it isn’t actually booked. Of course, we always talk about a certain accommodation/flight before we actually book it. However, we usually we do the research individually and then present a couple different options to the other. This makes the process a lot faster. Of course, you have to talk about each other’s needs regarding hotel, hostel, flights etc. Maybe your partner prefers a hotel over a hostel, or maybe a non-stop flight over a cheaper flight with one change. If you’re on a budget, maybe the cheaper option would be best? Just be sure to talk these things through together first to avoid searching for transportation or accommodation that your partner would not agree with anyway. If you’re both big planners, then it might make sense to book your activities or excursions in advance. Perhaps you’re renting a car in order to do a bunch of your activities? That’s also something you’ll want to book beforehand to ensure you get the best price and your preferred rental has availability for your travel dates. To research activities and “things to do” we usually look at TripAdvisor, use Get Your Guide, or read other travel blogs for inspiration. Usually, we have a friend or acquaintance who has visited the place before and so we can ask for firsthand knowledge first. Packing can be stressful – and before going on a vacation, you might be nervous anyway. We like to combat the stress of packing and the worry of leaving something behind by making a packing list. You can use your phone or even just a sheet of paper in a notebook. As long as you have all the items you’ll be bringing in one place for you to review. Even for us, it’s typical to overpack and to write too many things on the list. When it comes to actually packing the bags before the trip, we make an honest assessment of the clothes and gear we have, the time we’re gone, and the space in the bags we have remaining. At the very least, by making a list you won’t forget anything. As soon as you think of an item you’ll need on the trip – even if it’s the middle of the day – make a point of writing it down. That way you won’t forget to buy new sunscreen or to pack the thicker socks. 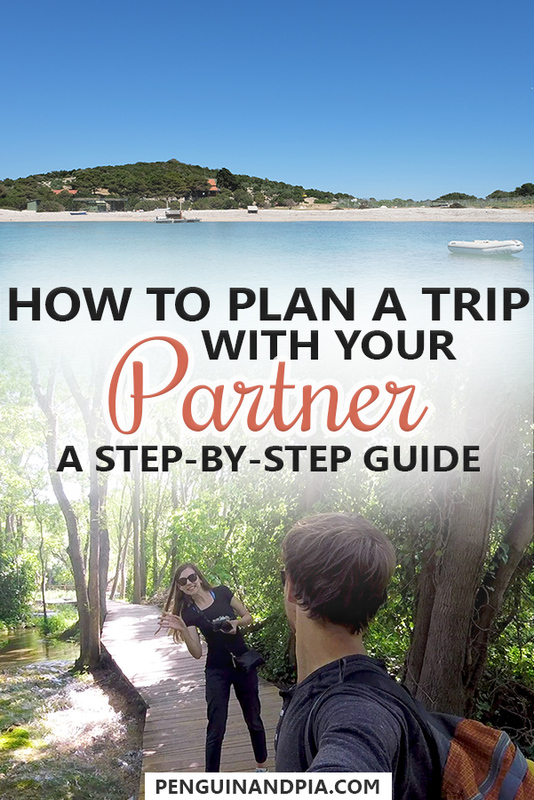 And there you have it – our 7 step plan for planning a trip with your partner. 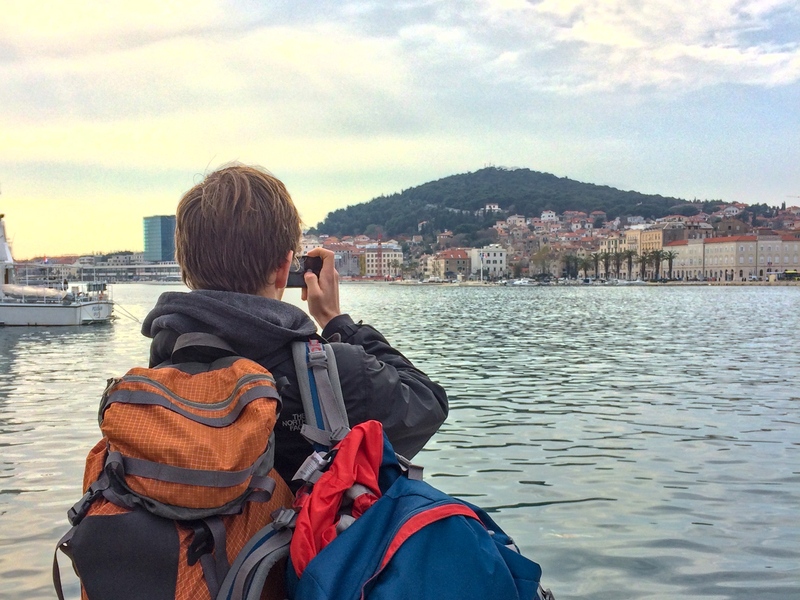 Trip planning can be an exciting and stressful experience but with enough smart research any itinerary can be tackled confidently and well-ahead of time when you’ve got a team of two. What do you think of our plan? Have you booked trips before with your partner? What else do you include that we might have missed? Let us know in the comments below! We’d love to swap stories! Lisa is a German content writer and marketer who studied Business and Languages/Cultures at university. She spent a year in the United States during high school, went to university in Copenhagen, Denmark, did an internship in Edinburgh, Scotland and studied abroad in Bilbao, Spain. Next to travelling around over 20 countries in Europe, she has also lived in Toronto, Canada on a Working Holiday Visa.